When I was still primarily creating works on paper during my former years of studio practice I had always been interested in sensing a flow, and allowing inner energies and imagery to inform, my making of art, as part of an intuitive and process based studio practice. Often involving many layers that each could radiate very different types of energy, a great deal of time could go by, before it at some point typically and surprisingly would result in a relatively simple form or pattern. When I entered graduate school I had already gone into the direction of doing my work outside the studio, applying a variety of media in relation to the found situations of interest. Having been assigned a beautiful studio space as my working space, like all graduate students in the MFA program, there was a beginning period that I again started to do more studio work, even some painting and drawing on paper. Even then and there however, my interest was focused on having my studio work relate to its spatial and conceptual context. Now one of the things I was interested in doing at Mills College, was get more familiar with the medium of video. I had seen plenty of video art in my life, finding some of it of great quality but at the time it was just not my medium. In the States there had been two isolated occasions where I had felt the urgency to rent a camera and experiment with the medium on a few ideas. But that work never got processed further as I missed the required facilities and skills. Now I had even founded and curated a video art program (I/O) that had shown me that the medium could be a very good fit into a public, urban, and interventionist practice. So I started to pick up the study of the medium further. And one of the things I started to do now the technical resources became available to me is that I started a performative type of practice in my studio. In fact it was of the things I had first done the last day I had had my previous studio, it just had come into me to try it then, and I had never seen the footage. In my studio at Mills I rembered it and I tried it again, liked it, and made it a regular practice. I would tape myself sitting on a basic chair or stool, in front of a studio wall, and facing the camera. There was a meditation aspect to it (a type of still practice I never really felt physically comfortable with). In my case it was about 'just being', and 'listening' but also 'forming' in response to the energetic process over time. Really very much like art prictice I thought. In each piece I would first sit still and sense, and then start 'performing' and improvising small body forms and movements, and at times sounds, while remaining seated and following the flow of my energy; until I sensed a natural end. Of course there was a start and their always came a natural end. As with my former painting practice I would never know how the work would develop but these time-based exercizes generally were fairly short, a good number of seconds to minutes long. The art practice of sitting, listening, and creating of form; in my case I was mostly focusing in concentration on my inner physical energy flowing over time, and created with my body corresponding, 'natural', and simple forms in response to the sensed energy. (Not a strange thing then that I later went on to take a course of Dance Improvisation.) This work was about the practice of art for me. Seeing the recorded sessions of this practice played played back from tape, they still communicated a certain quality to me, that one could connect with as an audience; if willing to sit, listen, and meet the other one self. A practice of video-recorded improvisational and intuitive performances, using small gestures and sounds while focusing on my inner-body energy flow. 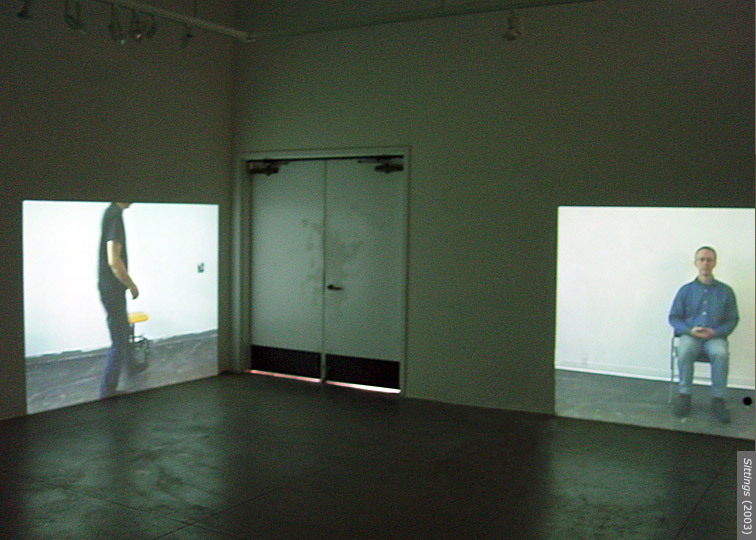 Four selected recordings were arranged together in a video installation room with four life-size projections, each projection set to repeat itself. An architectural design was made for its own custom room, with four half open, quiet spaces with benches.